It’s time for me to let loose again regarding prospecting myths. I find all of them to be as bizarre and funny as the myth that claims the Beatles never existed and the Cubs only won the World Series because President Obama wanted them to. Marketing is in charge of prospecting and creating leads. False! Salespeople buy into this so they have someone to blame when they miss their number. Fact is everyone needs to be prospecting, regardless of your role in sales. Nobody can be excused from developing prospects. A sales team will never have a prospecting culture until everyone is involved. False! Who is this person they call “nobody?” The people who say nobody answers the phone are the same people who never answer the phone themselves. We can argue that people are less likely to answer the phone, but that doesn’t mean “nobody” answers the phone. It might take multiple calls and multiple voicemails, but you can break through using the telephone. Specific results will vary by industry, customer type, etc., but to throw out a blanket statement that nobody answers the phone is simply false. Social media is the only way to prospect. Once again, this is false! The people who promote this myth are the social sellers who want you to buy their social selling program. For everyone who is on social media, there is another person who is not on it. If you want to limit the number of potential prospects you can have, then go ahead and just use social media. Social media is one tool in your prospecting tool box, but it can never be the only tool. I can’t keep calling this person for fear I’m bugging them. False! All of you timid people who don’t want to be successful in sales are welcome to buy into this myth. While you’re at it, go ahead and update your resume and find a different job. If you truly feel you can help the person, then you owe it to them to bug them. You owe it to them to keep reaching out until you do have a meaningful conversation. It’s time to get over the fact you’re bugging them, because that’s exactly what you’re doing. They don’t realize yet how you can help them. Keep going. Yes, you may very well have to adjust your timing and method, but don’t stop. In the end, they’ll be thanking you. Prospecting is something I do when I’m caught up with my other work. This is a major mistake! False, false and still false! This myth is believed by every salesperson who is afraid to prospect. Their belief is their time is short and they need to spend it taking care of everything else they need to be working on. We have such great customers we don’t need to prospect. False! Go ahead and buy into this one and you’ll wake up one day and find yourself without any business! It’s awesome to have great customers and it’s awesome when these customers tell others, but we can’t count on this as our only source of new business. Prospecting must be something that is done continually regardless of the amount of existing business. I can’t handle any more prospects. I have too many leads I’m working with now. False! This is as bad as thinking the weather will never change. The weather might be perfect today, sunny and low-humidity, but tomorrow could bring monsoon rains. You have to keep prospecting, regardless of how full your pipeline might be. Your focus needs to be on how to improve your process to allow you to move prospects through faster and not on slowing down the process. Prospecting myths busted! I admit I feel better now getting these off my chest. The arguments I hear about prospecting drive me crazy. In the end, it comes down to one thing — you deciding what needs to be done and going out and doing it. Sales is simply too good of a profession. I love it more and more each year. I look at what we do as helping the economy. Our economy is driven by business. Business is driven by sales. Sales is driven by prospecting. If we want to stop the economy, then all we have to do is stop prospecting. I make it my mission to do everything possible to help the economy by never having a day I’m not prospecting. 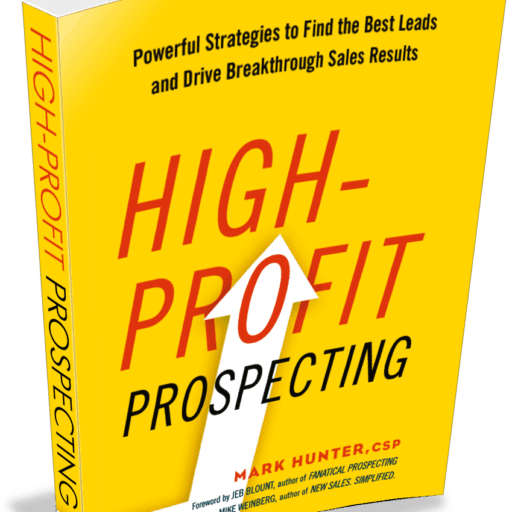 If you haven’t already, be sure to snag a copy of my book High-Profit Prospecting. In it I cover the essential prospecting strategies that set apart exceptional salespeople from average ones. PrevPreviousDo You Have Prospects or Only Suspects? Many thanks Mark, as usual Fabulous Article. Nothing FALSE about you and that’s a FACT! Cold calling is dying a slow death. It will dye as a profitable prospecting resource but not for many more years. The good thing is it works extremely effectively in certain industries and poorly in others. I make about 200 dials a day and it indeed works. The way to make it work better is to segment effectively and use automated dialing tools like burner phone. The challenge is not no’s but live decision makers. Change the game to increase the number of live conversations and you have a great cold/warm calling process. Thus automated tools and segmentation to personalize. I think it is good advice to use all the tools in the bag where applicable. Always solid “old school” words Mark.